To date in my little series I’ve dealt with the first of the twelve paired cranial nerves. Both of these serve exclusively special afferent functions. The third cranial nerve, the occulomotor nerve, dishes out parasympathetics and motor fibers. In addition it innervates the superior levator palpebrae which assists in opening the lid. The Nucleus of Edinger-Westphal is the second nucleus involved in the occulomotor nerve. It sits just superior to the motor nucleus. Its fibers run congruent with the motor fibers of the third nerve and run along the outside of the nerve. It exits the brain stem centrally and ventrally, essentially initially parallel to but inferior to the optic tracts. In the basil cisterns anteriorly it is easily compressed by an encrounching herniated uncus. 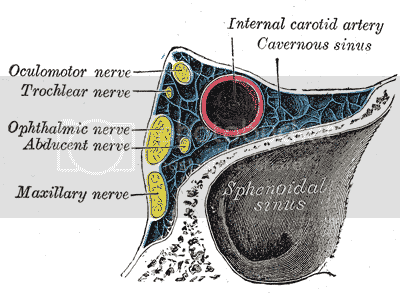 Just lateral to the posterior clinoid process the nerve pierces the dura and enters the cavernous sinus. In the sinus it is the most superior cranial nerve and pushed more medially. It exits through the superior orbital fissure where the parasympathetic fibers almost immediately synapse with the ciliary ganglion. The motor fibers go on to innervate the superior rectus, medial rectus, inferior rectus, inferior oblique and levator palpebrae. Post ganglionic parasympathetic fibers from the ciliary ganglion go on to innervate the sphincter pupillae which causes miosis and the cilliary muscle which, on contraction, causes the lens to relax and accomidate for near vision. Clinically occulomotor nerve palsies are at times associated with diabetes. Classically the palsy associated with diabetes spares the pupillary light reflex. This is felt to be because the blood supply to the nerve run supperficially along it, supplying the pre ganglionic fibers the easiest and the ischemic neuropathy associated with diabetes is thus more likely to affect the motor fibers along the watershed zone. The relationship of the motor and pre ganglionic fibers also explains why in uncal herniation syndrome the first sign of a compressive occluomotor nerve palsy is a dilated pupil as the pre ganglionic fibers are the first to be compressed and this leads to unopposed sympathetic action causing mydriasis. There is a unique syndrome called Adie syndrome which leads to essentially isolated loss of ciliary ganglion nerve bodies and thus a tonic, chronically dilated pupil.